The show debuts on Dec. 1 and seeks to start conversations about hard-hitting topics. 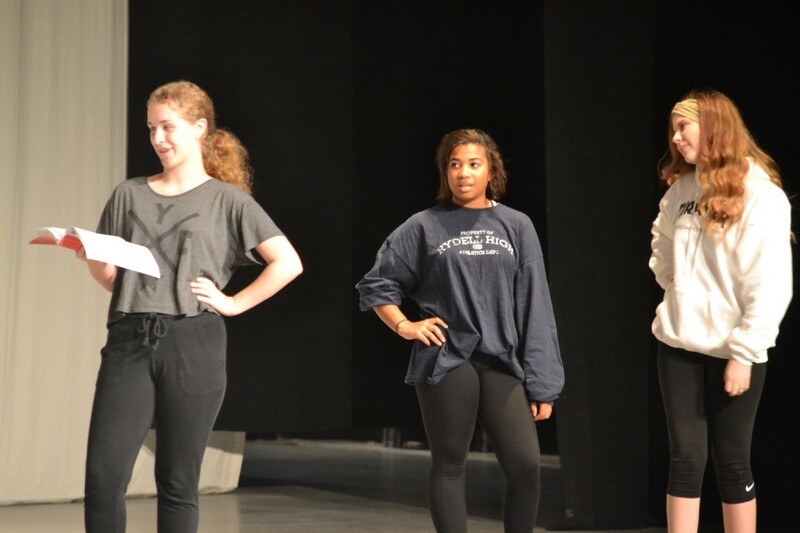 From left are Megan Bryan, Audrey Floyd and Isabella Suleta as they rehearse for Curtain Call Performing Art Center’s Upcoming performance of ‘Heathers: High School Edition’ set to debut on Dec. 1. The show is the first production in Curtain Call’s new fall teen program. When Curtain Call Performing Arts Center started its new teen program this fall, owner and director Anne Kessler hoped her theater program could also start conversations about hard-hitting topics that were relevant to teenagers in today’s world. To accomplish that goal, Kessler chose “Heathers: High School Edition” as the program’s first production, with the idea that her teenaged performers could immediately start dealing with topics such as bullying, teen suicide, murder, homophobia and gun violence in a high school setting. Based on the 1988 dark comedy film of the same name, Kessler said Curtain Call’s production of “Heathers” would hopefully allow the adults in her audience to open the same lines of communication with the teenagers in their lives as Keesler has been able to do with the teenagers in her show. “It’s highly dramatized, so there’s murder and fake suicides, and mean, mean, mean, mean girls, but we have conversations with the kids about how when things feel bigger than they can handle, they can just know that down the road it’s not going to be as bad,” Kessler said. In preparation for the show, Kessler said she’s also been researching the emotional developmental patterns of younger adults, who Kessler said don’t actually reach their full emotional capacity until their 20s. During rehearsals, Kessler said she and her staff also speak with the teenage performers about the sensitive issues they’re dealing with on stage, including ways to have them channel similar emotions before learning how to let them go. “It’s really interesting the conversations that have come about and what the teenagers have been doing with the material, because it’s so intense … they’re very receptive,” Kessler said. One such performer is 15-year-old Emma Witkowski, who said the show broaches topics she feels not many people in society discuss with teenagers. Agreeing with Witkowski is Nick Olszewski, another 15-year-old performer. Curtain Call Performing Arts Center will debut its production of “Heathers: High School Edition” on Dec. 1 at 7 p.m. The show also runs on Dec. 2 at 7 p.m., Dec. 3 at 3 p.m., Dec. 8 at 7 p.m. and Dec. 9 at 1 p.m. and 7 p.m.
All shows will take place at Harrington Middle School Theatre, 514 Mt. Laurel Road. Tickets are $12, and children 12 and under will not be admitted without a parent/guardian as this show carries a PG-13 rating.